Among the reality television concepts I think would work, if only for a small and quirky viewer population, “Name This Vessel” has potential. The host would lead seasoned sailors, all blindfolded, on 10 unique sailboats, and once below, take off their blindfolds and let them guess the specific vessel type based on the layout of the main saloon. If I had been a contestant on that show last weekend, I would have failed miserably. The show host would have blindfolded me before we faced the water and then turned and led me down the docks and onboard the sailing vessel Mandy—which would have been tricky with the low tide due to a cold westerly and clumsy step down from the dock. Then, he would have led me to the cockpit and down below, trickier still due to my need to turn around and go backward, blindfolded, down steep steps through a narrow companionway. I would have looked bewildered. I have been onboard the Pride of Baltimore II, the Schooner Woodwind, the HMS Bounty (twinge of sadness), several tall ships, a skipjack, a bugeye, and plenty of lovely custom woodies; this boat possesses qualities of each and a classic pirate-ship attitude, yet without being able to see beyond the curtain into the V-berth or deeper into the aft cabin—or up at the rigging—I would have proved incapable of guessing the boat type. I may have guessed, “Thirty-five-foot schooner-like vessel?” My host, who might resemble Alex Trebek dressed as a ship captain, might say, “Sorry. You’re wrong. It’s a 28-foot Bristol Channel Cutter.” As has been the case with every Bristol I have ever met, I loved Mandy. I had met Mandy’s owners, Bob and Erin, at the Eastport Yacht Club’s Lights Parade awards party, where they were playing music (in the fog) on the deck of the new clubhouse. After purchasing the boat and fixing her up in Deltaville, VA, they departed in early December to sail to Annapolis to live for a couple of years, pay off the boat by playing music as Rib Bone (rib-bone.com), teaching guitar lessons, and working at other jobs to fill the cruising kitty. Like others I have met who step beyond dreaming and cross over into realizing their adventure dreams, they seem extraordinarily lighthearted. When they say, “Come by for a drink,” they mean it. So we stopped by for one… or three. Bob is six feet tall, seemingly absurdly tall for a man who lives aboard a 28-foot boat; yet Mandy boasts six feet and four inches of head room. A funny, bespectacled, wooly-bearded percussionist, Bob also does computer-aided design work. 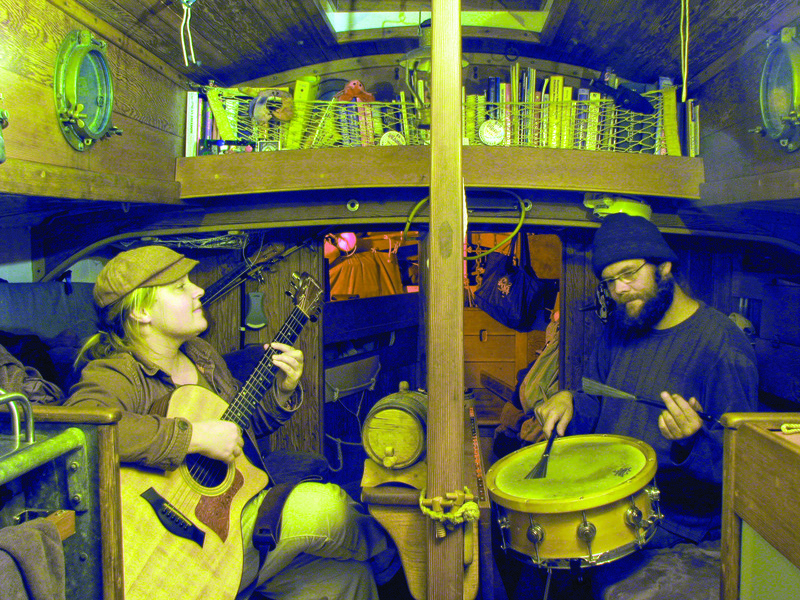 Erin, whose height and tweed hat fit living on a small bluewater cruiser quite well, is a musician and composer with a master’s in ethnomusicology and a specialty in Eastern Canadian sea shanties. (You can’t make this stuff up.) They bonded one summer after a sail on an E-Scow on Keuka Lake, “the jewel of the Finger Lakes,” in Hammondsport, NY, where Erin’s mom owns an Irish pub. Somehow, through a distance of 3000 miles (she studied in Seattle, WA, at the time), these two bright, adventurous souls launched a friendship that became a romance one summer back in New York on an O’Day 22 sailboat. And so, by the light of the lanterns and the warmth of one tiny space heater in the roomiest little sailboat in the harbor, we enjoyed a hearty laugh, a nod to Aesop’s tortoise, and a toast to sailing slowly and enjoying the ride. This article first appeared in the February 2013 edition of SpinSheet and again in the January 2014 issue of the OTC. We feel that this is a good story to start the new year out with and way worth repeating! « Is It January 1st Already?